Baldwin Park City Manager Vijay Singhal, referred to as the city’s CEO, on Wednesday laid out Baldwin Park’s accomplishments in the last year during his presentation of the city’s Year in Review report Wednesday night. Among the achievements, he cited the city’s one homicide last year as the lowest in 32 years. However, local businessman Greg Tuttle said the numbers don’t tell the whole story. “We have a gang problem. We have a lot of problems in this city. It’s not safe,” he said during public comment Wednesday night. During his report, Singhal said no city is crime-free. “It doesn’t mean we are crime free, but no city is,” he said. Singhal also highlighted the city’s upgraded bond rating and success in enacting more strict policies on tobacco, which has earned the city a top rating from the American Lung Association. San Gabriel Valley Tribune Staff Writer Thomas Himes is a finalist in the public service category for a statewide journalism contest for his reports on legally questionable police checkpoints and vehicle seizures in the Los Angeles suburb of Baldwin Park. The California Newspaper Publishers Association (CNPA) notified the Tribune Friday that Himes was selected as a finalist in the 2010 Better Newspapers Contest. The first place winner will be announced at CNPA’s annual banquet April 16 in Los Angeles. The San Gabriel Valley Tribune is one of 21 newspapers in the 25,001 to 100,000 daily circulation division, Contest Coordinator Terri Vanderveer said. The Baldwin Park City Council suspended police checkpoints last year and drafted more lenient vehicle impound policies after Himes wrote a series of articles on the checkpoints and the $1.2 million police netted in vehicle impounds. The reporting staff here at the Tribune came together like the A Team … no wait … The Justice League (way more fitting) to check in on local cities to see what the City Managers and City Councils are making in the wake of news reports about the city of Bell’s City Manager making something like $800,000. Glendora City Manager Chris Jeffers makes $201,816 annually. San Dimas City Manager Blaine Michaelis makes $196,452 a year. Rosemead City Manager Jeffrey Allred gets $175,000 a year. El Monte City Manager Rene Bobadilla makes $170,000 a year. South El Monte City Manager Tony Ybarra takes in $120,000 a year. Covina’s Daryl Parrish’s annual salary is $199,500. Walnut’s Rob Wishner is paid $196,650 a year. La Puente’s Josi Kenline gets $160,000 a year. Industry City Manager Kevin Radecki takes in $158,133 a year. Diamond Bar’s James DeStefano’s salary is about $194,000 a year. Baldwin Park’s Chief Executive Officer made $152,000 a year in 2006, up to $800 a month in lodging, $1,200 a month in health and dental – reimbursed in cash if not all spent – and $300 a month in vehicle expenses or a city car. As for City Council stipends, San Dimas councilmen make $620 a month while Mayor Curt Morris earns $830 a month. In La Verne, the city council brings in $519 a month and is entitled to the same benefits as executive management employees. Council woman Robin Carder and Mayor Don Kendrick waived those benefits. In addition, the redevelopment agency pays $30 per meeting. City Clerk Evelyn Clark said they meet about four time per year. Glendora council members bring in $700 a month. Incumbent Manuel Lozano led in early election returns Tuesday night against former Councilman Ricardo Pacheco in the race for mayor. Meanwhile, in the City Council election, City Clerk Susan Rubio appeared to headed toward an upset win over incumbent Anthony Bejarano, according to early voting results. If elected, this will mark Lozano’s sixth term as mayor. He was first elected in 1999 and ran unopposed in 2007. There are no term limits in Baldwin Park. Figures for Tuttle were not available Tuesday night. His nomination papers were initially rejected by the City Clerk because he was not registered to vote in Baldwin Park at the time. He later qualified as a write-in candidate, although his name did not appear on ballot information mailed to voters. Tuttle, who owns Tuttle’s Parts Exchange on Ramona Boulevard, has been a vocal critic of the City Council and was a strong opponent of the city’s failed downtown development project with developer Bob Bisno. 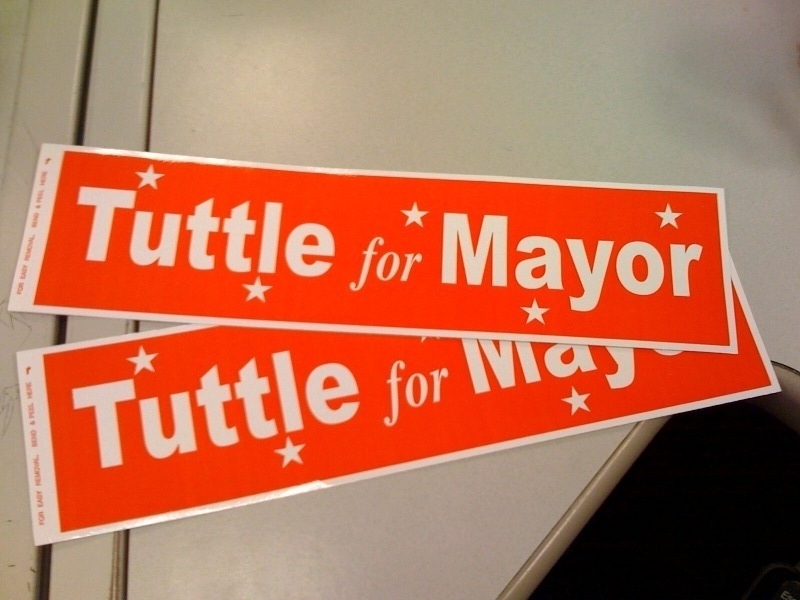 Although they were running against one another, Tuttle still supported Councilman Pacheco in the mayor’s race. Pacheco’s current term doesn’t expire until 2011. Because he hasn’t relinquished his seat, Pacheco will continue to serve on the council if he loses the mayor’s race. In the City Council race, Rubio and Garcia took an early lead against incumbent Anthony Bejarano and candidates Cruz Baca Sembello and Henry Huang, respectively. Despite their early leads, Rubio and Garcia cautioned against calling the race before ballots were counted. Garcia — who was “optimistic about her candidacy — said it appeared that more voters had turned out for this election than in years past. She believed that larger turnout would help her in the race. As for the city clerk’s seat, Christina Berumen led over Alejandra Avila and Brandie Rivera Woods, respectively. City Treasurer Maria Contreras ran unopposed for her seat. I wrote a story about a week ago about construction starting on a 2.2-mile stretch of the 10 Freeway in Baldwin Park, where Caltrans is building a carpool lane on either side of the highway. This construction — between the 605 interchange and Puente Avenue — is actually part of a larger, three-phase project aimed at creating carpool lanes on each side of the interstate from Los Angeles to the San Bernardino County line. Baldwin Park officials were pretty excited about the start of construction, because they say that portion of the freeway is heavily traveled and often bottlenecks. But it seems they’re not the only ones who have been looking forward to the expansion. Assemblyman Ed Hernandez, Assemblyman Mike Eng, and several other dignitaries from Baldwin Park, the CHP and MTA will be meeting at 10:30 a.m. on Tuesday — yup, Election Day — for a groundbreaking ceremony. Don’t fret, it won’t be on the freeway. It’ll be near it, in the parking lot area of Guadalajara Grill Restaurant, 14610 Garvey Ave. in Baldwin Park. Baldwin Park businessman Greg Tuttle is apparently back in the running for Baldwin Park mayor. Tuttle’s candidate filing was initially rejected a few months back by the City Clerk because he was not a registered voter in Baldwin Park when he pulled his candidate forms on July 22. But he’s since qualified as a write-in candidate with the county Registrar-Recorder. A lot of questions have been brought up about whether Tuttle really lives in Baldwin Park. The owner of Tuttle’s Parts Exchange on Ramona Boulevard used to live in Pomona and said he’s now renting a room in a house across the street from Mayor Manuel Lozano’s home. Tuttle’s not ready to show anyone his humble abode just yet, but he says if he wins the race for mayor, he’ll buy a whole house just for himself in Baldwin Park. We’ll see if he gets that far. Baldwin Park is keeping up its fight against a proposed trash sorting facility on the Irwindale border. A draft environmental report was recently completed for the project — a material recovery facility planned for a 17-acre site at Live Oak Avenue and Arrow Highway in Irwindale. But a consultant hired by Baldwin Park to review the document believes the report, prepared by Irwindale, is inadequate and should be re-written and redistributed. “It doesn’t reveal all of the likely environmental impacts of the project, or it understates them,” said Dan Sicular, a senior managing associate with the San Francisco-based environmental consulting firm ESA. Irwindale officials are currently preparing responses to Baldwin Park’s comments, and are also in negotiations with trash hauler Athens Services for a development agreement. Athens wants to sort recyclables from garbage at the site, before sending the remaining trash to a landfill. They claim state-of-the-art facilities will mitigate any potential health risks to both MRF employees and nearby residents. It should be pointed out Athens isn’t the only one interested in the Irwindale site. Valley County Water District wants to purchase just under 2 acres of the land to build two water storage tanks. The tanks — which would hold an estimated 3 million gallons of water each — would be built above ground on the land’s southwest corner, said Brian Dickinson, the district’s general manager. He wouldn’t comment on ongoing negotiations with Irwindale. Two candidates in the Baldwin Park November municipal election have been disqualified because of election code violations. Local businessman Greg Tuttle, who was running for mayor, and Victor Macias, who was running for the council, both had their filing forms rejected today because they were not registered voters in Baldwin Park at the time they pulled their nomination forms, according to Deputy City Clerk Laura Nieto. Tuttle, who owns Tuttle’s Parts Exchange on Ramona Boulevard, said he recently moved to Baldwin Park from Pomona just to run for mayor. But he filed update voter registration affidavit two days after pulling papers for the open seat. Anyway, Tuttle said, he didn’t think he “had a chance in Hell” to win. Instead, he’ll now be backing Pacheco in his run against incumbent, Mayor Manuel Lozano. Tuttle also says he’ll be moving back to Pomona now …. The November election filing period in Baldwin Park has closed and the names are in. Incumbent Mayor Manuel Lozano will be running against Councilman Ricard Pacheco and local businessman and gadfly Greg Tuttle for the mayor’s seat. Incumbents Marlen Garcia and Anthony Bejarano will also be facing off with some new faces for two open council seats. Among their competitors are Cruz Baca Sembello and City Clerk Susan Rubio. The mayor’s race should be an interesting one with Pacheco — who has long been on the outskirts of the Council — going up against this colleague. Also, Tuttle’s presence should mix things up, considering that he’s been threatening to “clean house” for months. The only thing that’s still unclear is exactly where Tuttle is living. He used to be a Pomona resident and his filing address on his nomination forms link to his business. But he’s said in the past he would be moving to Baldwin Park … All members of the council must be Baldwin Park residents. As a side note, the filing period of City Clerk has been extended through Wednesday, 5 p.m.